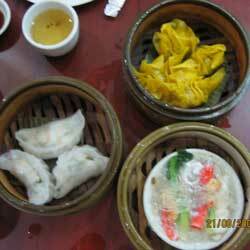 The YahooGroup, PinoyFrugalFoody scheduled a Binondo tour to get the members acquainted and to partake of the culinary pleasures Chinatown has been known for. Having missed the previous one due to a climb on Mt. Tarak, I eagerly awaited for this one. With local veterans to give us a hand-holding walk-about eating tour, I was salivating like a Pavlovian dog. Unfortunately, my friend and I didn't see anyone at the meeting place. It turns out, no one recognized the other. We decided to explore on our own. The first thing that caught our eyes was the signboard saying "Specialty Fresh Lumpia...since 1950". I'm a sucker for teaser like that. At P24/pc, it was not bad. It's fresh lumpia that doesn't get any better. We tried the special lumpia with seaweed for P34. Save your P10. The regular is better. You can also skip the tofu. It looks appetizing, but the taste pales in comparison. The President's Restaurant is the big place where a big crowd goes. Since we were just 2 looking for good dimsum, we took the Tea House instead. Dimsum selection wasn't that extensive but they were fresh and flavorful. 3 orders totalled P170. It's not exactly student price but well worth it. I don't know why I constantly crave for good hopia, but I do. Ongpin is ground zero for the best hopia in town. I took them all - Eng Bee Tin, Ho-Land and Poland. I was a kid lost in a toy store. I even ordered the same Ube flavor from all of them and taste-tested them - my vote goes to Poland. The problem about doing a food tour specially in Binondo is that there's only so much you can eat and there's a whole lot of eating places to explore - there's the fabled estero, the much-talked about Lido Café where coffee is brewed using the vacuum pot, etc. Well, the good thing about it is, it always give promise of more to discover the next time around.